At this moment, “Dino boy” is glued to the TV watching Tangled and he loves it. And what’s wrong with that? He also owns The Little Mermaid and Beauty and the Beast. Ok, so I bought those for myself, but still. 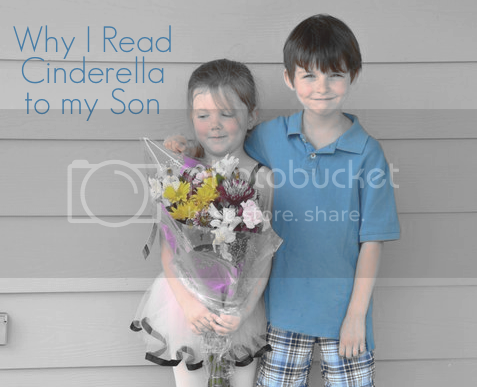 Quite often he requests Cinderella as a bedtime story. While I’m reading him these “princess stories” I think about the message I want him to get from them. They may have been created primarily for girls, but surely boys have something to learn too. There seem to be two primary themes for the males in these stories. Whether he is the hero who rides in to save the princess (i.e. Sleeping Beauty, Cinderella, Snow White) or he is transformed from bad to good by the heroine's good nature (i.e. Beauty and the Beast, Tangled, Shrek) by the end of the story, the Prince & Princess are living in romantic harmony. So, why doesn’t my son have stories like this geared toward his gender? Sure he has Superman to look up to, but why are stories of romance only appropriate for little girls? Now I don’t have any girls, but I do have friends with daughters & I see how much more stressful raising a girl in today’s society can be. We don’t want them to be “princesses” anymore but independent, bright, successful young women without waiting hopelessly for a Prince Charming to come along. And trust me, I’m all for our society moving in that direction, but it makes me wonder…what are we (as moms of boys) supposed to teach our sons? Do the good old fashioned rules of chivalry still apply? Regardless, I tell my boys the same thing you tell your daughters: Go to college, be anything you want to be, follow your dreams, yada yada yada. But sometimes I feel I have a great responsibility in teaching my sons how to treat girls. Are they still expected to open doors and bring home the bacon or are these traditions considered ancient and offensive? Okay, I realize I may be jumping the gun here. He is only 5 & the only girls he knows are just as willing to get knee deep in dirt as he is. But it’s never too early to lay the foundation, right? All of this gender-role controversy really racks my brain and causes me to break out in a cold sweat. It feels like I’m fighting a battle bigger than myself. Being a woman dabbling in feminist theory while raising boys can be a daunting task. But what better gift can I give to society than to properly raise my boys to be good men. Let’s face it. No matter what we tell little girls, deep down we all want to be princesses. Hell…I’m 28 & I still want to be a princess. Lucky for me, I married a man who occasionally indulges in treating me like one, but who also pushes me to be the best “me” I can be. So, now I have the heavy responsibility of raising two more just like him. Yes, these are the complicated conversations I have with myself while reading Cinderella to my son at bedtime. And it usually boils down to one thought. If millions of little girls are dreaming of being princesses, who is teaching the boys to be Prince’s? Wow. So glad you pulled this post off the shelf to share! Not having kids, I haven't done much thinking on the subject. I really like your attitude that someone needs to treat boys how to be princes too. And I love that you are sharing all the stories with your son & letting your him pick the ones he likes best! !